So while there was nothing to wake up early for we slept in on our 3rd day. When I woke up my feet felt like they were in cement. It was so hard to move! Walking is no big deal. Pushing a 40lb wheelchair with a 57 pound kid in it uphill and back around a huge park takes a toll!! When we asked Hailey what she wanted to do she right away said, "Disney Jr. Live!!!" Here we go AGAIN!! Out of the 3 times we went Josh only went twice. It's easier on the little kids when a huge 6'4" man isn't sitting in front of you...LOL! Josh went and stood in line so he could go on the roller coaster and I went in with Hailey. I totally didn't mind. I really liked the show! It got better and better! Selfie of Hailey and Mom! After the Disney Jr. Live show we waited for Josh and Hailey loved the trolly car people that drove by and sang. They reminded me of Newsies! We saw Donald again, but he didn't have time to stop and take a picture so he just waved as he passed us by. We looked EVERYWHERE for the Toy Story characters and couldn't find them anywhere. Finally someone said that Buzz would be around soon, so we waited for him. Hailey really wanted to see Jesse but they said she wasn't going to be there...sad face! 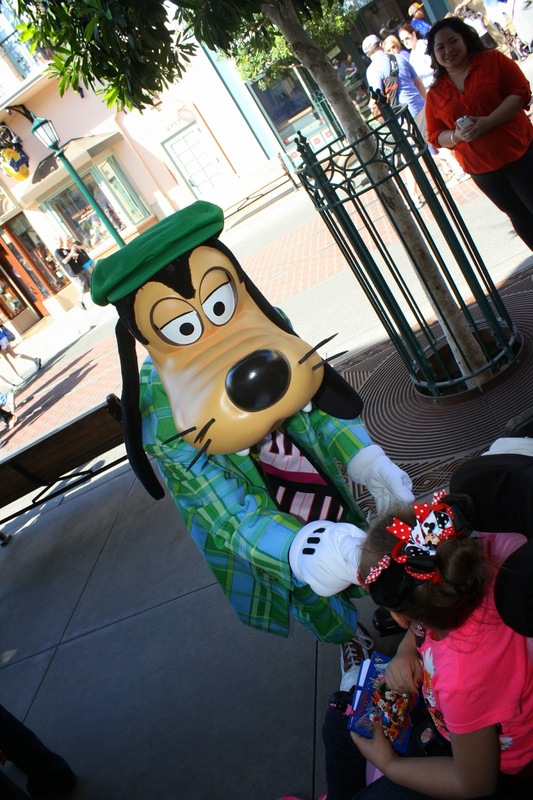 Goofy didn't have time to stop for a picture either so he fist bumped Hailey and went on his way. After all that we did Luigi's Flying Tires...AGAIN and we then we did something that we weren't too sure of and it may have been a good idea at the time, but in the end it wasn't too smart. We passed Soaring over California and I asked the line guys what they thought about us taking Hailey in. You sit in a row and there is just a seat belt and it wasn't spinning or jerking. He said that she'd probably LOVE the ride. I asked Hailey if she wanted to go flying. Hailey asked if it was a plane? Well...sort of. Now if you are just a regular normal person this ride is pretty amazing. You feel as if you are actually flying over California scenery. If you are a person with balance and brain issues it feels as if you are ACTUALLY flying over California with nothing to hold on to. Hailey was shaking and having spasms cause she felt as if she was suspended in the air and falling and flying. It was very rough for her. I didn't know if I should cover her eyes or what. We were stuck in the ride for the full 60 some seconds and it felt as if it were forever. It really did a doozy on her. Not a good choice and now we know... We did some window shopping afterword. I love how Disneyland has the caramel apples in the shape of different characters for $10 each. That was going to be my souvenir from the trip! Hailey had patiently waited 3 days for a Mickey Balloon so Josh snuck off to get her one and she was ecstatic! We ended up leaving the park pretty early that day and heading back to the hotel. We took the long way through Downtown Disney and checked out that HUGE Disney Store. I think Hailey would have been happy spending all day in there! So while day 3 is over we still have 1 more day of fun planned for Hailey right before we leave the next day. Hailey didn't know it but tomorrow we were going to have lunch at the American Girl Store and it was going to be very memorable!! Stay tuned! Day 2 at Disneyland 2014 - Autographs Galore! !